A boy named Aaron joined a gang of children set into getting into trouble. They passed a Catholic church and saw people go in and out of wooden box. They asked what was happening, and a parishioner explained to them. Then a dare: who will go in and tell this priest outrageous lies about false sins? Aaron – son of Jewish socialist parents who had given him no religious training- takes the dare. He goes in and starts with these crazy tales. The priest cuts him off, and berates him for mocking the sacrament. And then the priest gives him a penance: “You go out into the church to the cross and say 10 times – ‘You did this for me and I don’t give a damn'”. 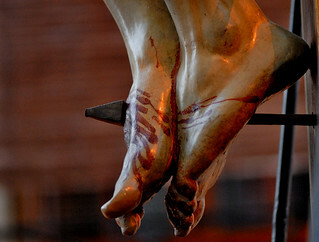 Aaron dutifully goes to the crucifix, and sees Jesus marked with blood, bruises, torn skin in his shoulders from the weight of the crossbar and knees ripped from falling down. He starts – you did this for me and I don’t give a damn! 1, 2, 3, – fourth time “You did this for me – and I don’t give a damn?” fifth, sixth – seventh – You did this for me? In the following year, 1940, Aaron and his sister were received into the Catholic Church. This is in occupied France. Aaron’s parents are furious with him and his sister but the children are resolute and go to Mass. In 1942, a Nazi roundup catches the mother, who had gone back to Paris to take care of their store, and she is arrested and deported to Auschwitz. The father, Aaron, and his sister barely escape and must be hidden by others until the liberation in 1944. Aaron took the name Jean-Marie at baptism – John Mary. He became a priest, a bishop, and eventually became the cardinal archbishop of Paris, Jean-Marie Aaron Cardinal Lustiger. Here is the great mystery of Great Friday as it is called in our rite. It is a good day and a great day because Christ offers himself for the salvation of the human race, but also for the salvation of individuals, because his love is so enormous. It is not only for all the children of Adam – He also loves each son and daughter of Adam individually. This love is a love that no other figure in religion can equal. Both God and Man, united in one Person, Who not only has no blame or sin, but created those who do have the sins, willingly suffers the entire Passion not out of duty or obligation but out of singular unique love. Since death entered by a man’s sin, in justice a man had to put it right. However, no man could possible be adequate or proportioned to bridge that gap between the human race and God. Thus, one who is both man and God had to do it. This is the one day that the Roman Church does not offer a Mass, only their version of the Presanctified with distribution of Communion. This is the one day that the Eastern Churches do not give out Communion, except to the dying. 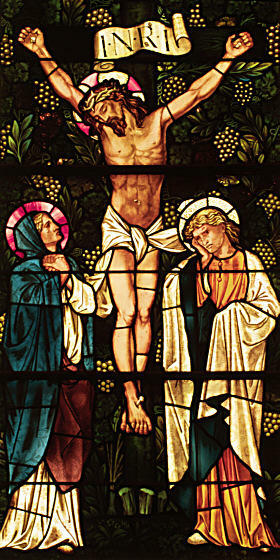 The Churches do these things to convey to us the solemn tragedy of the Savior making it a day of sorrow, of contrition for our sins, of remorse. And what is all the worse is this – that 2,000 years later, Christians and people who were born as Christians continue to grievously sin against the commandments of God, and our so-advanced western society has managed to ignore the suffering of the descendants of the very first Christians who are at this very time being tortured and murdered and massacred because they are, in the words of Muslim preachers, worshipers of the Cross. It is an honorable title I think to be worshipers of the Cross. It was through the sacrifice of the Cross that Aaron Lustiger and hundreds of millions of others come to faith in Christ. The Baby in the manger is obviously an attractive figure, but the torn body of Jesus given up out of love forces us to decide once and for all for God or for the fallen world. Simon of Cyrene is honored as a saint – his sons were known to the first Christians of Jerusalem. He comes to faith as a result of being forced to carry the cross of Christ, he discovers in the suffering, bloody, mangled, exhausted, dirty Jesus redemption. The good thief, called Dismas, acknowledges that he and his companion deserve crucifixion. This means that they were both dangerous, perhaps even wicked, men, as the Roman legal code had a variety of punishments for offenses. But there on the cross, listening to Jesus’ statements, witnessing the little group of women and John, he sees and understands that Jesus is the Suffering Servant of Isaiah, the Messiah. In icons, the Virgin Mary, Mother of God, the Theotokos, does not faint away or collapse in tears. She stands, hands folded, and watches her little boy die, and gives strength to Him. John witnesses, testifies, both in his Gospel and in the icons, the youngest of the Twelve and the one who truly loves Jesus completely, standing there at the end. We can condemn the forces of the world, the leaders who we are disappointed in, the public sinfulness that is paraded around to be imitated by the world’s children, and we can talk about the beautiful verses of the Vespers we are singing and the power of the Gospel we just heard and how Jesus is so wonderful, but in the end the question comes to this tonight – do I understand that He did this for me? that He would willingly go to the Cross in this same condition of thirst, fatigue, caked with blood and dirt, stripped naked to be mocked by the leaders of His own people, over and over and over again, for each soul that has lived, is living, and will live in the ages to come, so great is His love for each of us? No other religion offers such a self-sacrificing God as Christianity does. And this is Who I am called to imitate, to follow, to suffer with daily, to love daily, and to communicate this love to the world around me. This You suffered willingly/ this You suffered, just for me. If I can do this, then I will discover that atop Mount Calvary and in my own deepest personal grief and sorrow, when I both accept Christ’s suffering and embrace it and so strip myself naked of the things I sinfully hold onto, that I can them come, as St John of the Cross tells us, to the glorious banquet of charity, peace, joy, and justice, where only the honor and glory of God dwells. And this is what this broken world needs, and this is what I can offer to it in Christ’s Name, and this is what will lead me into the glory and joy of the resurrection. Thanks so much for posting this Fr. Chris. It was great to hear it live last night! I’m thankful for the posting since I could let my wife read since she stayed home with the baby. As always, the Byzantine Great Friday Vesper service was amazing. Have a blessed Holy Saturday and a JOYFUL Easter.